Good morning and happy Sunday to all of you. It's Kris here to share another round of Uniquely Unity inspiration. This month's kit is titled Everyday Wonderful Owls from the artist Tierra Jackson (and boy does she deliver a stunner with this adorable image!). Here's the card I made. It is colored with distress ink and markers. The background panel is a Memory Box die. 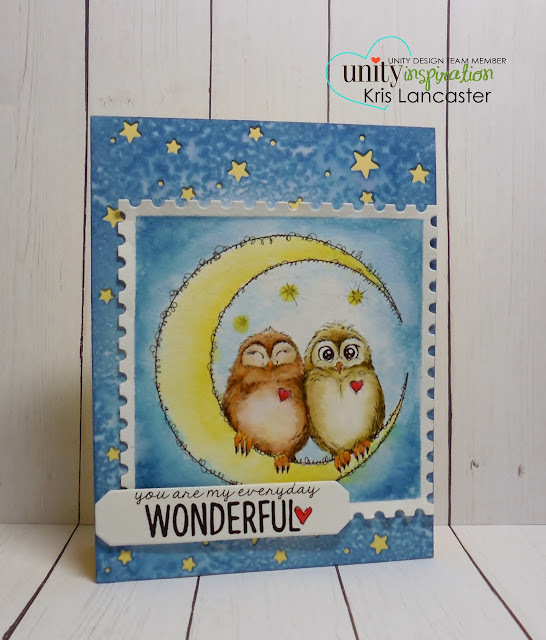 I thought a starry background would be perfect for the owls sitting on the moon. It was easy to create that mottled sky by simply blending distress ink over the panel and then spritzing with water. I also added a bit of glossy accents (from Ranger) on each heart. If you are ready to sign up for this monthly subscription, just click on any bold type in this post and you can start with this fabulous kit.